Hi friends. Turned out to be a nice day, cool, but sunny as opposed to all the rain we got yesterday. More and more I am seeing flowers finally popping up, tulips, daffodils, and crocus. So nice to see. I bought this adorable stamp awhile ago on clearance on line and just now getting around to using it. I don't put them away until I ink them up and make a card first, have a whole shoe box of stamps waiting for me...........not enough hours in the day, and I'm retired. Have been doing some genealogy again and once you get into it, hours pass quickly and before you know it, it's the middle of the night, but pleased with what I have found in the last week. by the reel, really reasonable. Entering this card in this challenge. Awwwww such a sweet image coloured so beautifully. I love the papers and all your pretty detailing too. Beautiful card. Love your arrangement and colors. The coloring is great. Sue this is a darling stamp and you colored it up so nicely. The pearls and that die piece gives it such a soft feminine look to it. I don't dare get into genealogy because of the time thing. I have a friend and that's about all she does on a daily basis. Have fun coloring and learning about and exploring your past this weekend. Sue, this is so cute! What an adorable card. AWE Sue this is just ADORABLE...what a sweet image!!! 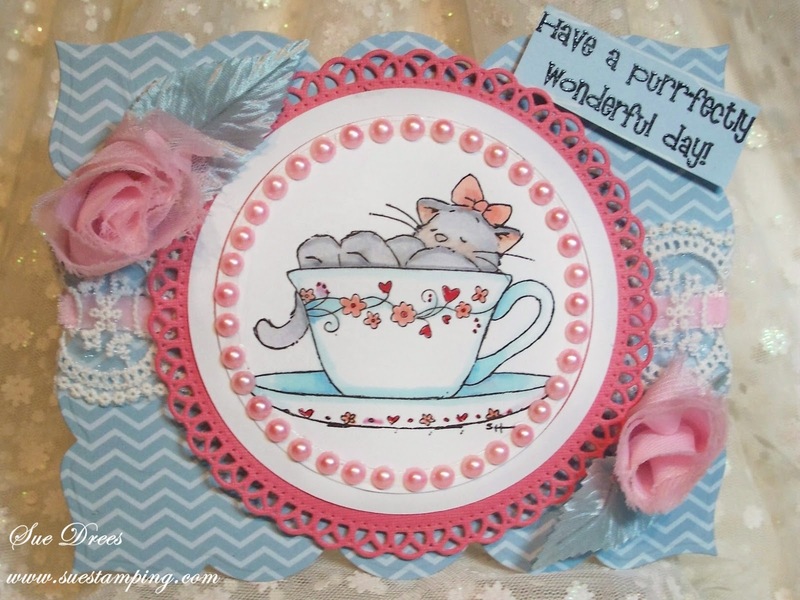 Beautiful card design and your colouring as always PURR-FECT!!!! Have a great weekend Sue!! 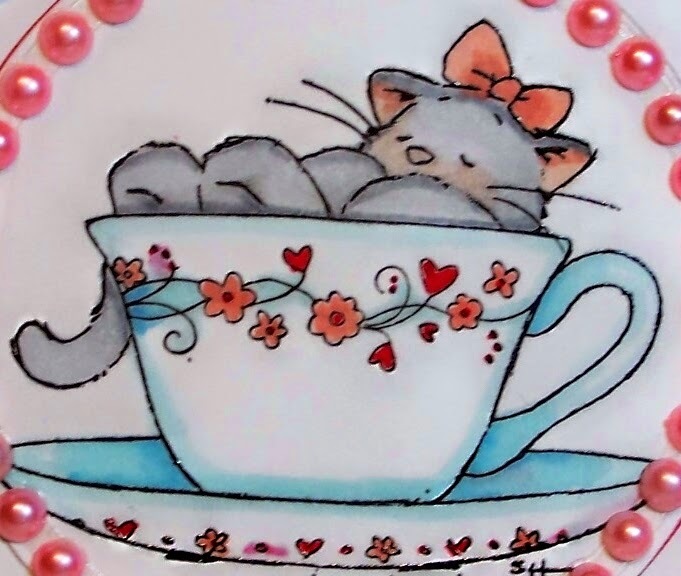 Hi sue oohh so pretty the image is just super sweet :) you can't beat a cat in a teacup! Beautiful embellishments too! Really pretty design. love the image! Thank you for joining Crafty Girls Challenge, hope to see you again very soon. Love the image and your wonderful colouring. I also like how you embellished the card with the pearls!